Adam Kline is the band lead and songwriter of Golden Shoulders. From performance to performance his bandmates may change but the music stays the same. 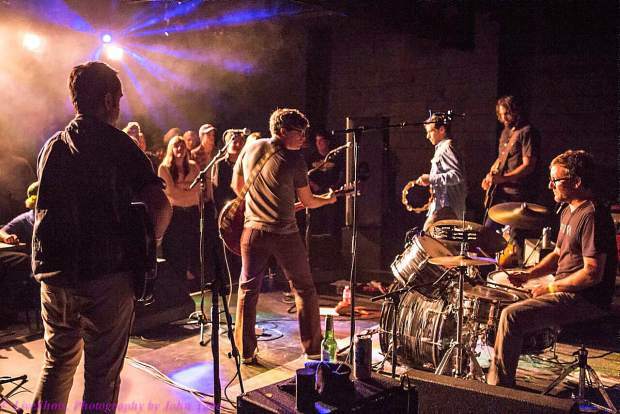 The Center for the Arts brings three Nevada County acts together this Thanksgiving weekend for a night of original music featuring Golden Shoulders, Davia, and the Moore Brothers on Friday. Golden Shoulders is a Nevada City-based band lead by songwriter Adam Kline. Formed in 2001, his bandmates vary from performance to performance. “Thanksgiving weekend is about people being back home. We try to limit the number of local shows we play in a year, but with everybody in town, this is a great time for us to play a big show for a big audience,” said Kline. Golden Shoulders’ most recent U.S. tour took them and Davia from Nevada City to Brooklyn and back playing almost every night. “It was fun and there were no giant disasters! It was Davia’s first time on tour and she traveled very well. She opened the shows with a solo set and then joined Golden Shoulders on violin and harmonies,” said Kline. Kline has taken various musicians under the moniker of Golden Shoulders on tour most years since 2004. Though the touring lineup is small, playing a hometown show at a venue like the Center for the Arts is an opportunity to go much bigger. Davia is a singer/songwriter from the mountains of Northern California. “Mesmerizing” is a term that seems to come up every time she plays live — her songs, completely original, are quirky but accessible, hopeful yet intense. In her debut EP, “Hush,” Davia delivers six emotionally captivating songs experimenting with guitar, accordion, egg crates and breaking bottles to tell familiar stories in a unique and edgy way. Songwriting brothers Greg and Thom Moore developed a small but devoted Bay Area following during the turn of the last century with intimate performances highlighting their close harmony singing. They each write melodic and sometimes surreal pop-folk songs and pass their lone guitar back and forth depending on the composer. The Moore Brothers relocated to Nevada County 10 years ago and continue to record and perform locally. Their seventh album, “Stay at Home,” will be released early next year.